Did you know that MILO comes from Australia? See this! In 1934, Australian chemist, Thomas Mayne created the nutritious beverage Milo and launched it at the Sydney Royal Easter Show. The name, Milo was derived from the famous Ancient Greek athlete who was known for his legendary strength. I grew up drinking Milo... thinking that Milo is a Malaysian-Singaporean popular drink but I was totally wrong. Then, I learned that Milo is in fact popular too in many parts of the world. Interestingly, Milo can taste very different in different manufacturing countries. So far, I have tasted the Australian, Singaporean and British ones and true enough I can detect the minor differences in the three different origins. HAPPY that I have baked these Milo cupcakes! Although the comparison of these Milo cupcake to my previous vanilla cupcakes are not exactly apples to apples, I can't help to think that these Milo cupcakes are really really really so much better. 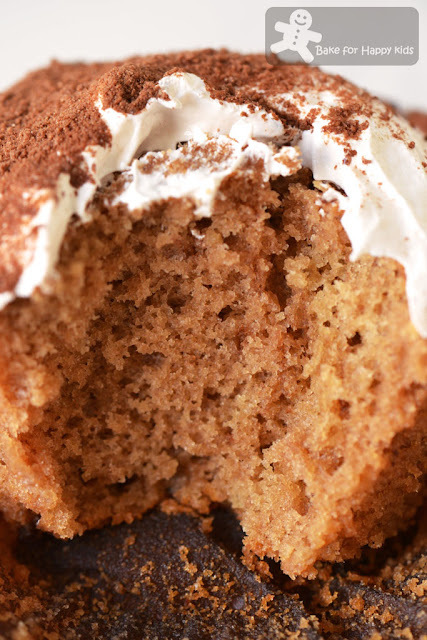 The Milo cake bases are moist, fluffy and delicious. 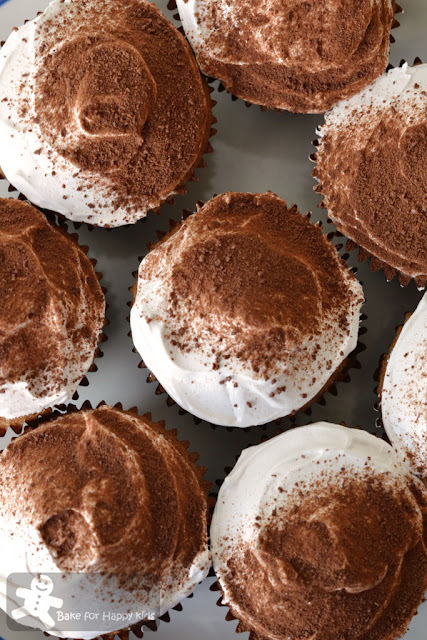 With no added fat, their Italian-meringue-kind of marshmallow icing is surprisingly creamy and compliment these cupcakes very well. We are all happy eating these cupcakes and me completely satisfied now that I have baked good celebration cupcakes for our Bake-along 2nd anniversary. Cheers! It is the time of the year that I need a holiday again... My family and I will be having a break in Singapore and Taipei for the next coming 2-3 weeks and will return on late May 2013. See ya! 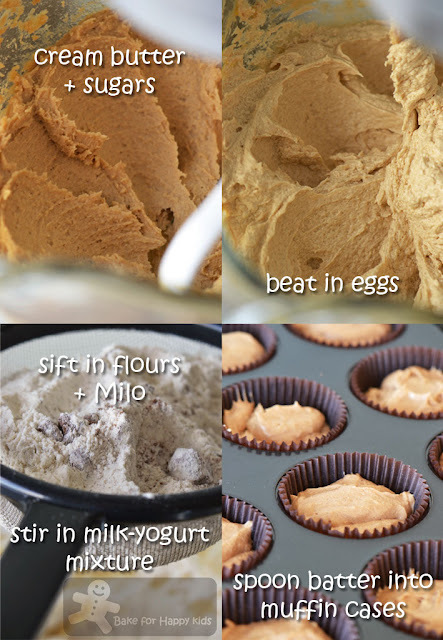 Milo Cupcakes! Feeling strong eating these? Light and yet creamy fluffy icing! They look like Milo roses to me! Preheat the oven to 180°C (or 160°C fan forced). Line a 12-hole muffin tray with muffin cases. Cream the butter and sugars until pale and smooth. Add the eggs, one at a time, mixing briefly after each addition. Sift together the flours and the Milo powder. 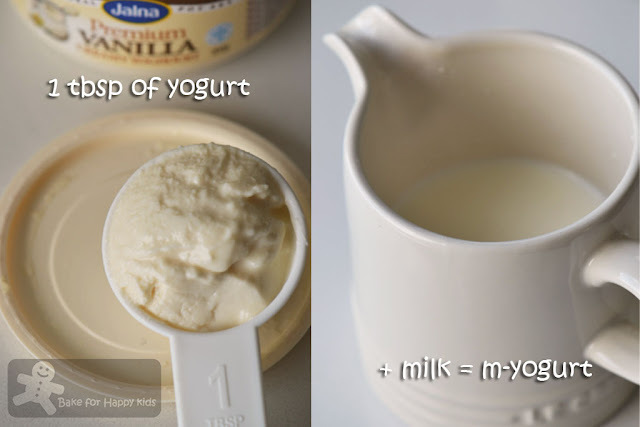 Measure the milk into a jug and stir in the sour cream (or yogurt). Spoon the mixture into the muffin cases, and bake in the center of the oven for about 25 mins (I baked mine for 23 mins), until risen and golden. Leave to cool in their tin for 10 mins and then carefully transfer onto a wire rack to cool completely. Once cool, ice with Marshmallow Icing and sprinkle with Milo. 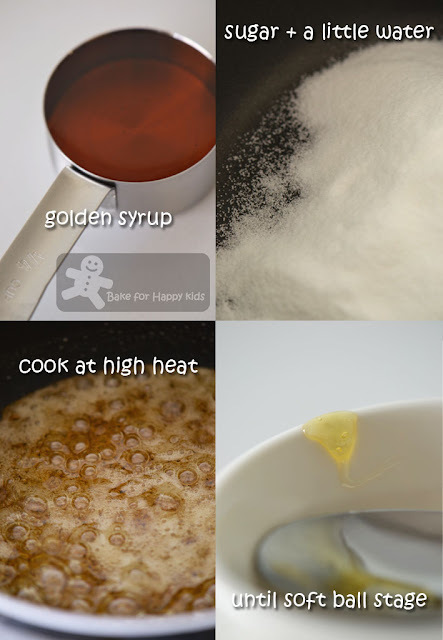 Put the sugar, golden syrup and water into a pan and cook on a high heat for about 2 mins until the mixture thickens and turns golden (the soft ball stage). 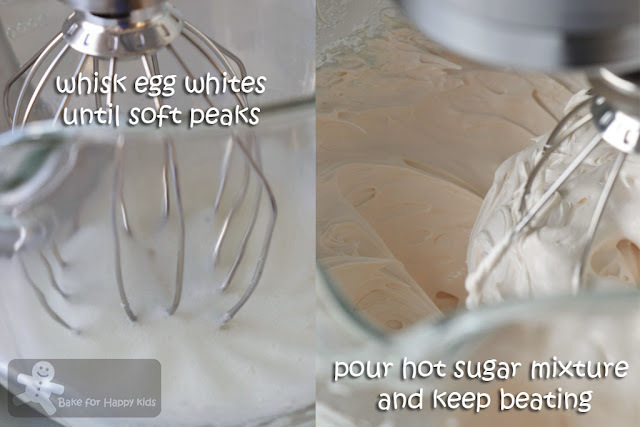 Whisk the egg whites until soft peaks start to form. Then keep beating while you slowly pour the hot sugar mixture into the bowl. Continue beating but at a higher speed until the mixture becomes thick, glossy and cool. Add the vanilla extract towards the end. This icing is easiest to work with while it is still a little warm, so try to use it right away. You can store it in the fridge overnight - but beat well with a spoon before reusing. Note: This amount of icing is too much to ice 12 cupcakes but I reckon that half of amount of the recipe might be difficult to prepare. Once again... 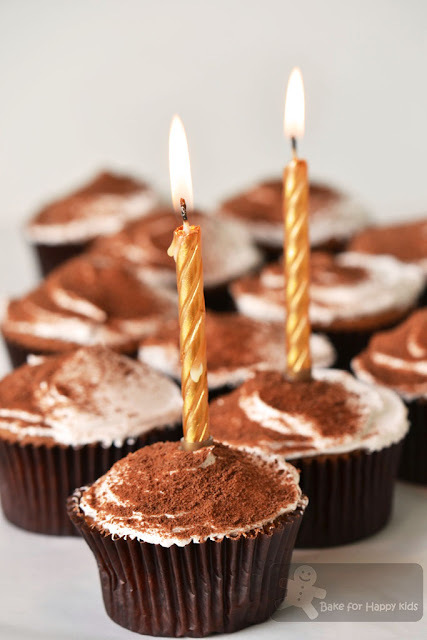 Happy 2nd Birthday to our Bake-Along! I, too was brought up on Milo in South Africa so your post was like a trip down memory lane for me. Sadly it is not easy to buy in the UK. I am sure I would love the flavour in these cupcakes. Happy holidays! We can't get milo easily in Belgium, have to go chinatown, but it's v exp! Luckily there is an equivalent called ovamaltine which i can get from the supermart, which tastes almost the same. Horlicks is even more difficult to find. Love your Milo cupcakes, do u btw know how to make milo biscuits? Lucky us... Horlicks and Milo are easily available in our supermarkets. I can say I have never seen or heard about Milo till this post. This was very interesting. Thanks for sharing it. Enjoy your upcoming vacation to Singapore and Taipei. I love MILO that's my favorite drink. Actually I'm drinking it right now hehehe. I'm gonna make this cupcake soon. thank you for sharing this recipe..I'm so excited about this. :) bookmarked! I love MILO and of course I grew up with MILO too! Hmmm..interesting MILO cupcake and kids will love it. Have a great holidays and enjoy! That marshmallow icing sounds divine! Milo cupcakes is very interesting! Funny that, nobody in my house fancy Milo, especially me! But I've got a feeling that they would really fall for this cupcake! Looks wonderful to me! I know of one other person who is a fan of Milo, Lena! Hahaha! She would love this cupcake as well! Anyhow, what a great idea to use milo as a topping too! Btw, this kind of reminds me of 'milo dinosaur' :):) Perfect drink for the weather these days! Ooo this is nice, Zoe! 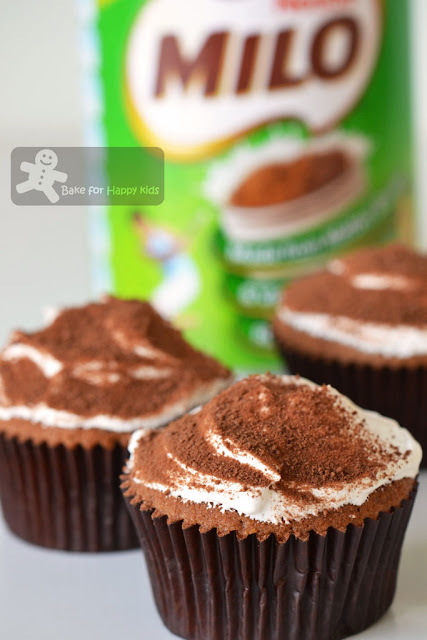 Love the idea of milo cupcakes. My son's birthday is coming up, i might make this. Love the last picture with the candles :) have a great holiday. As an Australian I grew up on Milo. YUM! Actually I have large container of it because I wanted the tin it came in. Now I have something good to bake with it! Thanks! Hello Zoe, coincidentally, I was thinking of Milo cupcakes yesterday! I have lots of 3-in-1 Milo at home and wonder if I can use it to make this too? Perhaps I will have to reduce the amount of sugar if I use 3-in-1 Milo? Most 3-in-1 Milo contains less Milo including sugar and creamer and wouldn't recommend you using the 3-in-1 as I'm not sure at all what is the outcome of the substitution. Didn't know that Singapore Milo has more Calcium... I like the Aussie one because it has more malty. The British seems to be richer and more chocolatey but it was more than 18 years that I have tried the British one and it might be different now. Zoe, these Milo cupcakes are lovely! I remember the Milo truck that made it's rounds when I was in school. I used to enjoy the excitement of queueing up with my classmates for a cup of cold Milo. So nostalgic! Yeah, I remember these moments too! Great memories! That's my favorite drink from the past:D I would mind having a piece of that delectable looking cupcake! So envious whenever I see people going for holidays! :P Wish I can take time off too but sadly that won't be anytime soon! Please don't be sad... Nice to stay at home too. I believe that your delicious baking can make you happy. I never knew Milo was from Australia! Learned something new today. These cupcakes look great! Yummazing cup cakes. They ook absolutely stunning & delicious. I love the Milo flavour in your fantastic frosting. Hello Zoe,thank you for visiting my blog and for following!. I absolutely love your blog,I'm following u too now! Nice to hear from you, Violeta! Somehow I suspected that Milo is Australian :) But I didn't suspect that you can make such cute cupcakes with it! I love anything Milo and honestly speaking, I prefer the Milo in Malaysia because I find the one in Australia a tad too malty for my liking! Anyway, just a question on the cupcakes - eaten without the icing, does the cupcake taste milo-y enough? I do find these cupcakes having a nice Milo taste. It is not as obvious and straightforward as being chocolate or strawberry but I reckon I can taste the Milo in them. What, really? I thought Australia only has vegemite, thanks for sharing this piece of useful information with us! The cupcakes look so soft there! By the way, the raspberry muffins recipe did come from Gary's Cookbook, the Comfort Food. Suggest using cake flour instead of plain flour as they would turn a bit hard in this weather. See the recipe now at Gary's book. Would love to try baking with this recipe and will use cake flour instead of the plain one. Hello Zoe! Hope u have a great holiday :) I've only tasted the British and Malaysian milo, and I have to say I prefer the Malaysian one. Would definitely love to try this recipe one day, looks lovely. This recipe is going to be my next project. my kids love milo and they are eating it out of the tin on nearly a daily basis! If you have time, will be nice to catch up. Would love to catch up but might be a a little difficult this time because I will be having late access to my new Singapore mobile no changing to new sim card. Keep in touch and hope to meet one day. You are right. Milo is chocolate malt powder. Hi Zoe, I grew up on Milo and is still drinking Milo every now and then,more than tea. I am a non coffee drinker. I find Australian Milo has the best taste, more chocolatey. Sometimes they are available here, but cost a lot more. 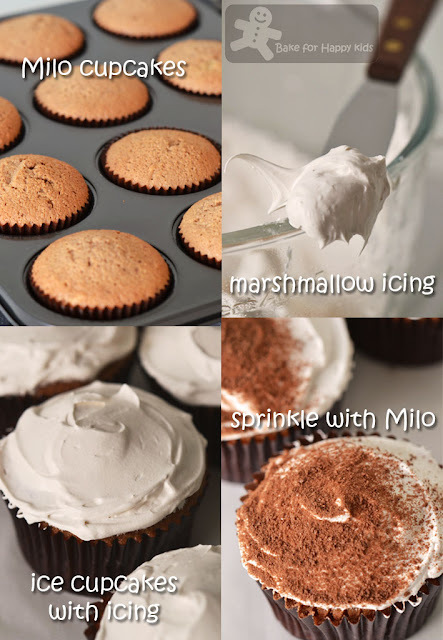 I will definitely try your Milo cupcakes, very lovely especially the frosting. Enjoy your holidays! I didn't know that ! But I grew up drinking Milo and even now if I've got a hankering for something comforting to drink :D Milo cupcakes sounds WONDERFUL and I bet taste really yummy ! Will steal your recipe sometime next week , okay ? Have a great vacation and keep safe ! What marvelous cupcakes, Zoe! I've never seen Milo around here...but I'll keep my eyes peeled. I'd love to try these beauties :) Have a wonderful holiday, my friend. This is a brilliant idea. My Aussie hubby will flip when I make them. Thanks! these are like cupcake versions of a 'milo dinosaur' i.e. ice cold milo with powder thrown in on the top. Yummy. I gotta try these. My boys love milo. I'm sure they'll love these. I never ever think about that Milo actually first produce in Australia. Thanks for the information. Happy holiday! Don't forget me....haha ! oh, i didnt know that milo originated from aust! i also have the same thought as you that it is a malaysian singaporean drink. you know it's my favourite drink and drinking it so often. btw, have a nice holiday! Thanks for introducing me to Milo! I've never heard of it, but now I've learned a new ingredient! These cupcakes look wonderful, Zoe!!! I don't know what Milo is, but I am certainly intrigued. What beautiful look MILO over the cupcakes, the kids love it!! MILO cupcakes, woot! Nice bake, Zoe. oh...these luks so cute n tempting me lot..really nice cliks btw..
Milo Cupcakes. Wonderful! Will definitely baked it for my family. Thanks for sharing. Happy Holiday in Singapore. Happy Mother's Day & enjoy your holiday trip! No wonder I've been told that the best Milo you can find is the one comes from Australia. But never knew it actually originates from there! thanks for the info, Zoe and your cupcakes look simply awesome. Happy Mothers Day! These cupcakes do taste different from typical chocolate cupcakes with less intense chocolate flavours. Hope that you will baking these cupcakes. mmm, yum yum yummy... we used to eat milo with bread, do u do tat too wen u r young too??? i heard, australia milo taste better?? true? Yeah... I remember eating the soft white spongy kind of bread with heaps of Milo with drizzles of condensed milk. Yum! I like the Australian Milo because it is slightly thicker in texture and reckon the preference can be very subjective. I love Milo! The cupcakes look absolutely delicious! MMmmm..yummm! I love milo. These cupcakes look so beautiful. You've inspired me to bake some for myself! Wow, those look and sound amazing! I have seen Milo in some stores here, and now you've picqued my interest and will have to buy some! I always have Orzo in the house, which is a barley drink (I did a post: Not just for babies-Toast & Orzo, on my blog. Have you tried it? I have not hear or taste Orzo before. I would love to try this one day. Is it similar to Milo? With toast, it must be very delicious. Wow, I had no idea that Milo is originally from Australia. Never baked with Milo before, but the cupcakes look delicious and are very cute, so I'll try to prepare them one of these days. Milo is also very popular in the Caribbean as a breakfast drink. Wow I never knew that it was Australian. I always just assumed it was British since we were a former colony. Your Milo cupcakes looks so good. I will give it a try very soon. I thought the Marshmallow icing has marshmallow in it but reading into the recipe, then realized there isn't any. Interesting topping and is this topping more firm than whipping cream? The marshmallow icing is much more stable and firm than whipped cream. After baking these cupcakes, I would prefer to use this almost fat-free icing now than whipped cream. These cupcakes look and sound incredible! I miss milo! I am looking forward to making these! haven't managed to get over for a while - life has been manic, but these cupcakes look absolutely stunning! So tempting! Se ve irresistible su cupcake me encanta con milo muy muy rico,abrazos y abrazos. My kids love Milo and these look awesome Zoe! Hi Zoe, Is there a chef to cook from in June or do we come back in July with Curtis Stone? I am finally getting my online self back in business and I want to catch up with my favorites. Cook like a Star for Nigella has been postponed to August and we are cooking like Curtis Stone for July. Hope to have you cooking with us in these 2 months. I can understand your concern. You are right and I always prefer to frost most of my cupcakes especially the fluffy kinds on the day that I need to serve them. You can make the cupcakes one day ahead and make the icing and frost the cupcakes on the day that you to serve them. Cheers!